An ideal location in Brussels for a one-day workshop, high-quality seminar or executive committee meeting in the heart of the political capital of the European Union. Two meeting rooms with natural daylight, can hold up to 40 people in a quiet atmosphere, perfect for teamwork sessions. 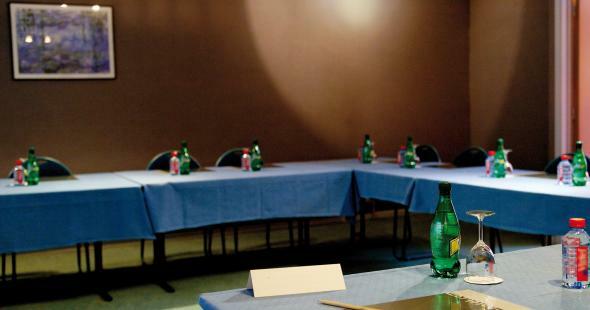 Includes the use of our spacious bar for coffee breaks and downtime during your meetings. Choice of meals provided by the hotel, or the chance to discover Brussels' cuisine in the many nearby restaurants where we can reserve a table for you. Package : one day study, Semi-residential or Residential seminar in single room on request. Technical equipment available: notepads and pencils, screen, flipchart, overhead projector, phone in the rooms, high-speed wifi connection. On request (extra charge) : Barco projector, camcorder, carousel slide projector, microphone, video projector, LCD projector.